If you haven't ever watched Gary speak then you should definitely watch this (apologies for the F-bombs, that's just how he rolls). 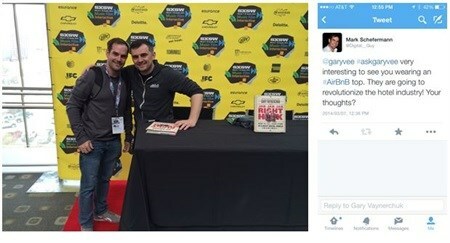 Originally, Gary Vaynerchuk wasn't on the schedule for SXSW 2014, so when I saw that he was the keynote speaker on the first day, I made sure that this was one talk I didn't miss. I have quoted Gary so many times over the years in so many social media strategies, he is all about "out-caring" one's competitors and truly listening to your audience and giving a damn. He also spoke briefly about his new book "Jab, Jab, Jab, Right Hook - How to Tell Your Story in a Noisy Social World", looking forward to reading it. It was incredible to be able to meet Gary in person, he is an inspiration when it comes to the world of social media, he just gets it and it is mainly through his own experiences at WineLibrary.com. Here are some great quotes from his second book "The Thank You Economy" this will give you a taste of Gary's opinion towards social media. "A lot of companies resist building a Facebook wall, blogging, or starting a Twitter or YouTube account because an irate customer might post negative comments. So what? Would you prefer that the customer post them somewhere else where you have absolutely no way to reply? Or somewhere you can't even find? If you're that afraid of your customer, you might want to take a closer look at how you're doing business." "If you are going to launch a campaign, it has to be one that evokes an emotion so that people feel compelled to share. Give them something to talk about, unleash the power of word of mouth, and allow them to pull you into their consciousness."?? "Develop creative work that allows the platforms to rally, to work together to extend your story, continue the conversation, and connect with your audience. It's not enough to simply throw a Twitter or Facebook logo at the bottom of your ad, or show Facebook.com/yourbrand at the end of your TV commercial. That's about as exciting and useful as saying "We have a phone!" or "Found in most stores!" "In the future, the companies with tremendous "relationship capital" will be the ones to succeed. Society is creating an ecosystem that rewards good manners, high touch, honesty, and integrity. Ten years from now, every company will have a Chief Culture Officer on staff and, if big enough, a team dedicated to scaling one-on-one relationships." Essentially, companies just need to start caring and work towards becoming a truly consumer centric business. At the end of the day, customers just want to know that you care and that you are listening. Without customers, there would be no business. "There is only one boss. The customer. And he can fire everyone from the chairman down, simply by spending his money somewhere else." - Sam Walton, 1977. My knowledge and enthusiasm for the digital world enables me to think creatively and challenge briefs. My passion is strategy and showing how digital can open new opportunities for clients. Well conceived digital strategies and campaigns will push brands ever forward in the consciousness of their audiences and lead to long lasting adoption, advocacy and allow them to forge individual relationships with their audiences.